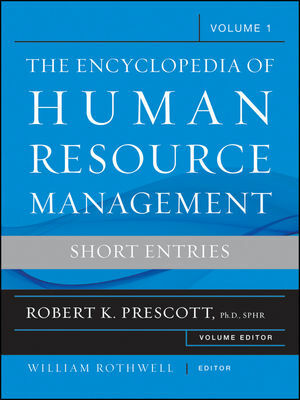 The three volumes in The Encyclopedia of Human Resource Management offer a comprehensive review of the essential issues and most important information available on the topic. Each volume in the encyclopedia contains contributions from some of the most celebrated names in the field of human resource management (HRM) and addresses the myriad challenges faced by today's human resource professionals. Volume 1 puts the focus on the definition of terms and practices that are most relevant to today's human resource management (HRM) professionals. The contributors bring an up-to-date perspective of HRM definitions and practices and for ease of access, the terms are presented in alphabetical order. Each contributor includes the most recent research on a particular topic and summarizes a new and progressive definition of these important terms. The book begins with an enlightening discussion of the evolving practice of talent management and contains the following topics: Affirmative Action, Assessment, Business Ethics, Campus Recruitment, Career Development, Compensation, Drug Tests, Employee Relations, Flexible Benefits, Glass Ceiling, HR Metrics and Analytics, Mergers and Acquisitions, National Labor Relations Act, Quality Circles, Recruitment and Selection, Self-Directed Work Teams, Social Responsibility, Strategic Human Resource Management, Training Needs Analysis, Work Family Balance, and more. The Encyclopedia of Human Resource Management gives human resource professionals the knowledge, information, and tools needed to implement the best practices in the field. William J. Rothwell, Ph.D., SPHR, professor of Workforce Education and Development, Department of Learning and Performance Systems, Pennsylvania State University and president of Rothwell and Associates, Inc. He is the author, coauthor, or editor of over 60 books and hundreds of articles and book chapters on human resource management, training, and development. Robert K. Prescott, Ph.D, SPHR, is associate professor of Human Resource Management at the Crummer Graduate School of Business at Rollins College in Winter Park, Florida. He is the coauthor of The Strategic Human Resource Leader.